I’m still not quite done with this project. And since it is vacation time, I had some time to spend on it, leading to a release with some improvements that I’d like to present briefly. Another weak point that became apparent was editing the ingredients on the edit page. Initially, the ingredients list was just a plain text field. The previous release changed this to a list view, but the editing support consisted just of a popover with plain entries to add a new row. 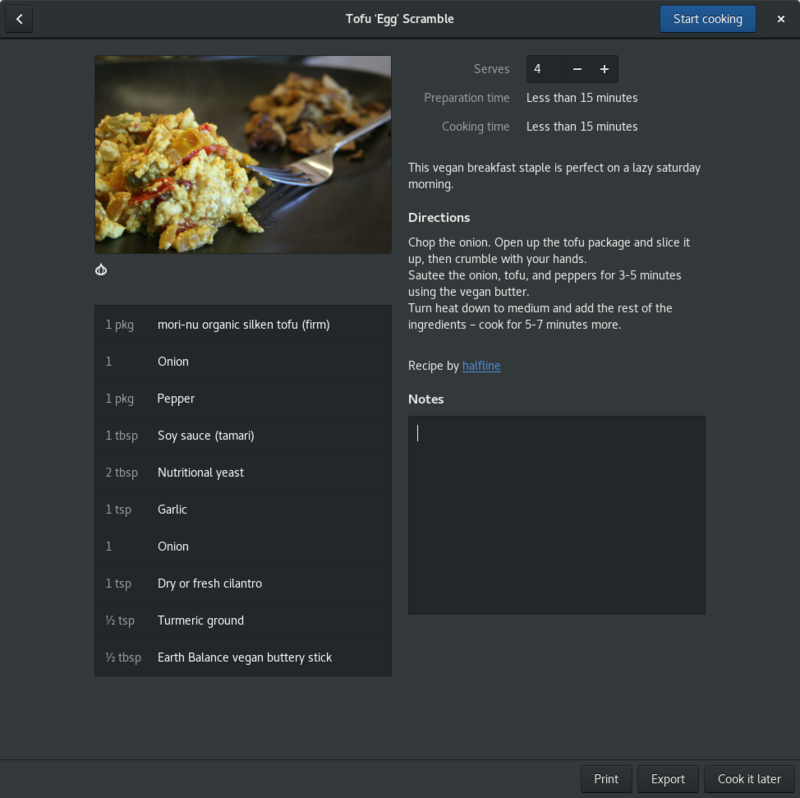 Lastly, not really a new feature or due to my efforts, but Recipes looks really good in dark as well. 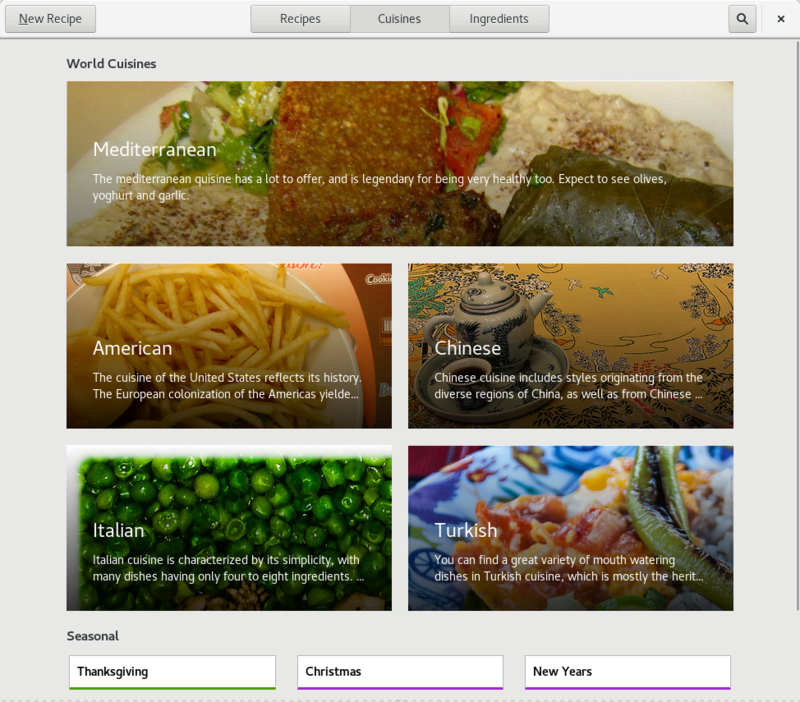 The one thing that is not covered yet is sharing recipes by email. For that, we need work on the Flatpak side, to create a sharing portal that lets applications send email. And for the first goal we really need your support – if you have been thinking about writing up one of your favorite recipes, the holiday season is the perfect opportunity to cook it again, take some pictures of the result and contribute your recipe! It has been a few weeks since I’ve first talked about this new app that I’ve started to work on, GNOME recipes. Since then, a few things have changed. We have a new details page, which makes better use of the available space with a 2 column layout. Among the improved details here is a more elaborate ingredients list. 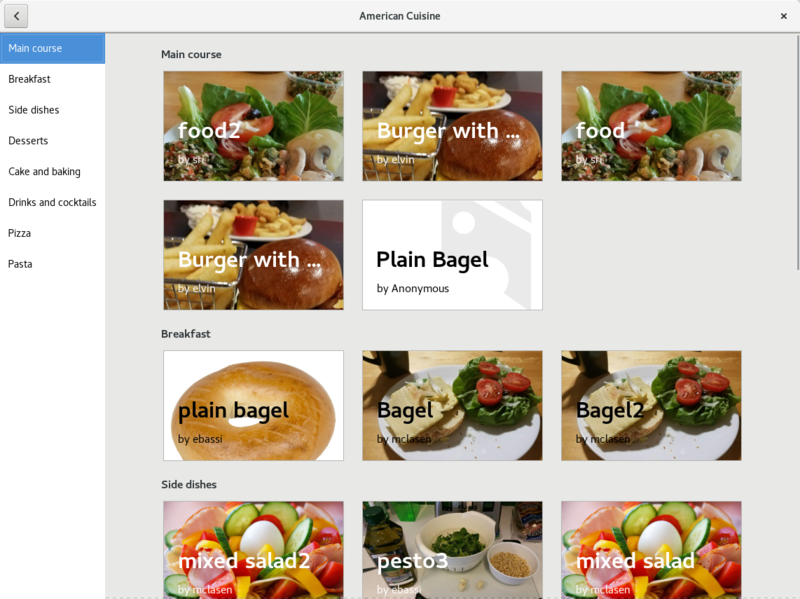 Also new is the image viewer, which lets you cycle through the available photos for the recipe without getting in the way too much. 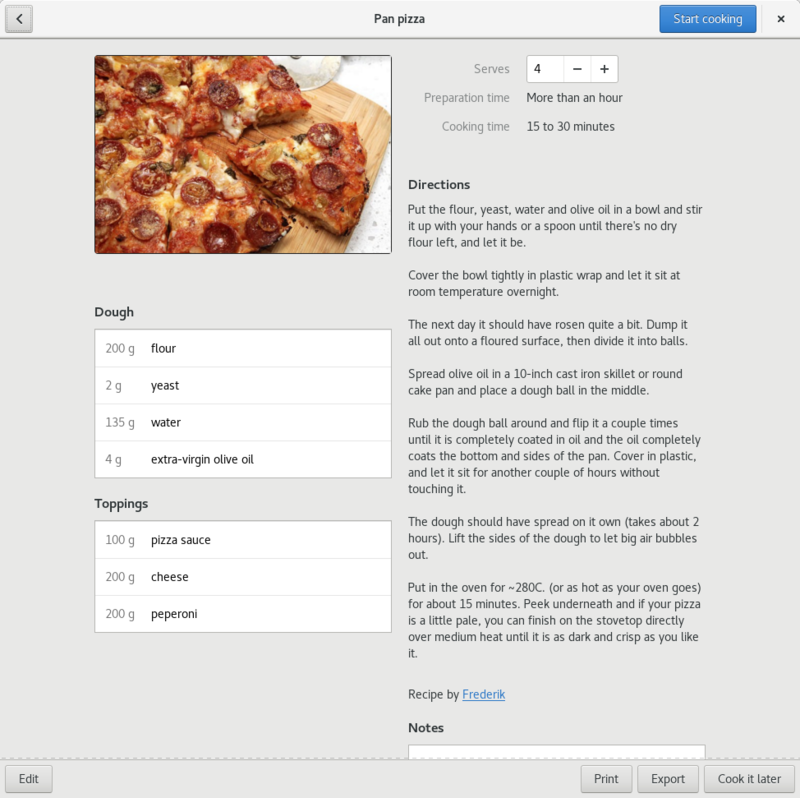 We also use a 2 column layout when editing a recipe now. 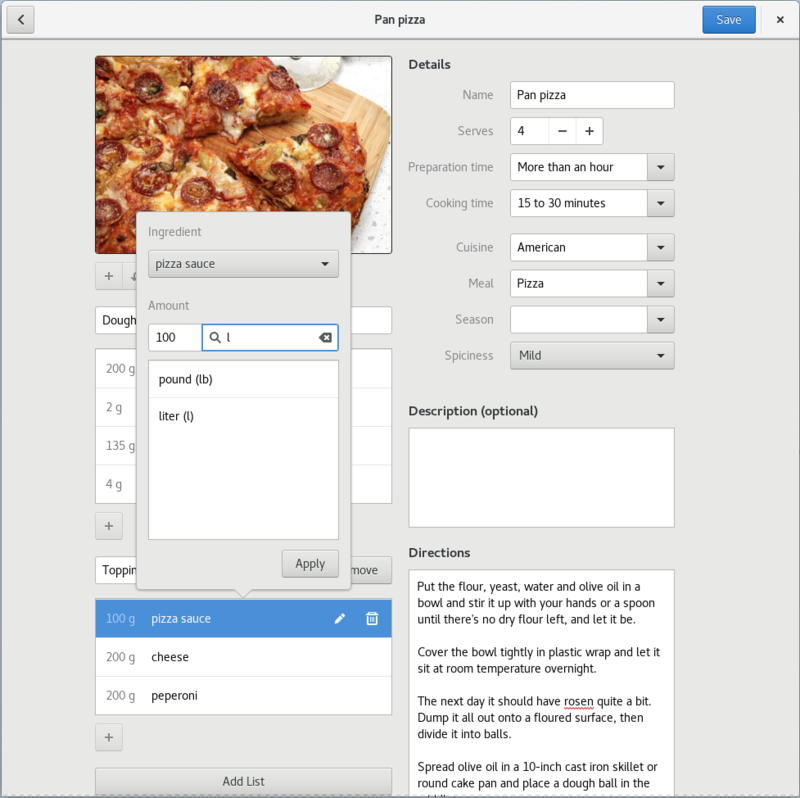 If you want to give recipes a try, the sources are here: https://git.gnome.org/browse/recipes/ and here is a recent Flatpak. 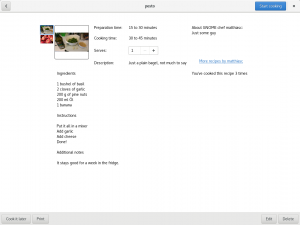 GNOME needs a recipe app, since we all love to cook. This is not a new idea. Looking all the way back to 2007, the idea of a GNOME cook book already existed back then. For one reason or another, we never quite got there. But the idea has stuck around. Why did I start to write this app from scratch (instead of e.g. trying to give a face-lift to venerable gourmet) ? 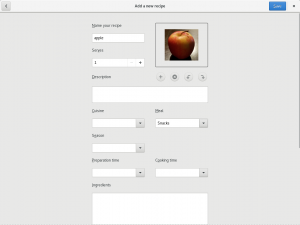 Beyond the obvious reason that I love to code as much as I love to cook, I wanted to give GNOME Builder a more serious test by starting an application from scratch. And I find it very useful to take a look at GTK+ from the application developer side, every now and then. 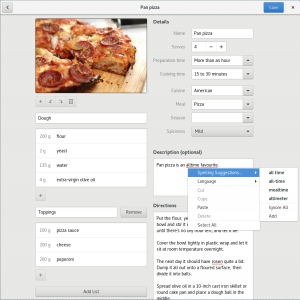 In both of these regards, the endeavor was already successful and has yielded improvements to both GNOME Builder and GTK+. For the cooking part, you can judge that for yourself. The main reason for writing this post is that we are at a point now where we need contributions to make progress. The idea is that we will include a decent set of recipes from GNOME contributors all over the world with the application. Therefore, we need your recipes, ideally with good photos. All the photos and text you see in the screenshots here are just test data that I’ve used during development, and need to be replaced with actual content. 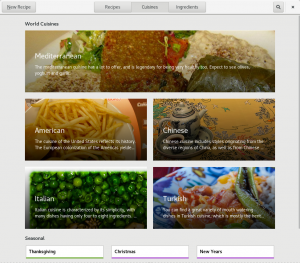 So, how can you contribute your favorite recipes ? 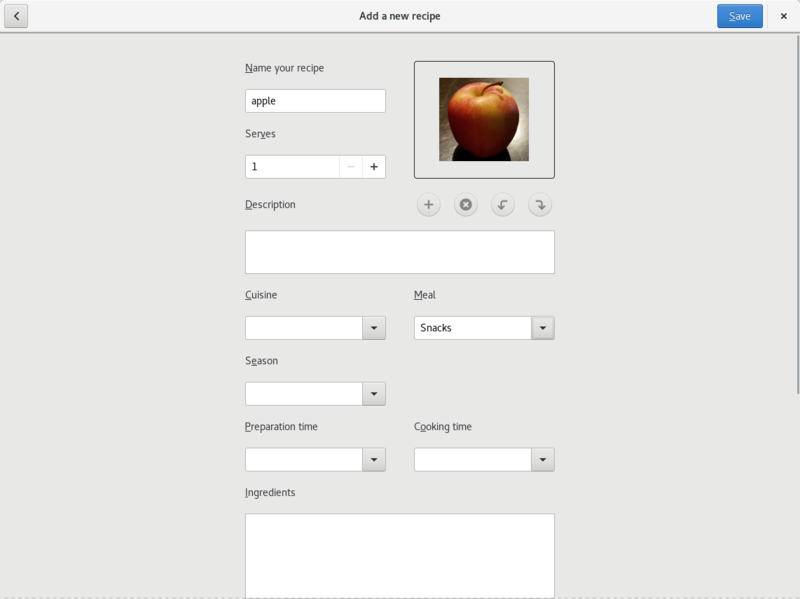 Add your recipe to the app, and when you are satisfied with how it looks, you can use the Export button on the details page to create an archive with the recipe and related information, such as images. 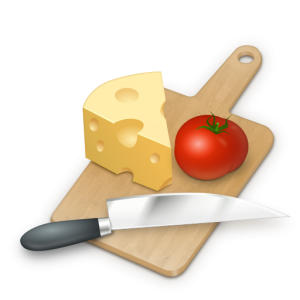 The archive also includes information about the author of the recipe (ie yourself), so make sure to provide some information for that in the Preferences dialog. Please make it clear in the bug that all the included images are your own and that we are allowed to ship it with the app. Beyond recipes, there are plenty of other ways to contribute, of course. 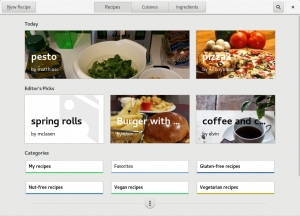 While I’ve tried hard to get many of the features in the initial design implemented, there is a lot more that can be done: for example, unit conversion, or a way to easily share recipes, or to print a shopping list. 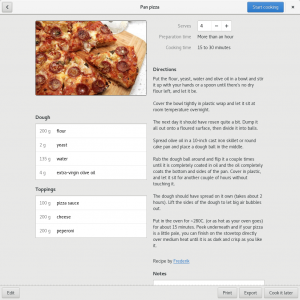 The project started out on github, but it is also available on git.gnome.org now. The design materials are collected on the GNOME wiki. Of course, I did not get this far on my own. Thanks are due to several people. First and foremost, Emel Elvin Yıldız, for the designs and feedback on the implementation, Jakub Steiner for the icon and visuals, and Christian Hergert for keeping this idea alive and for making GNOME builder work great.